I know, a sad topic for any of us!! But, with so many thinking that a mini will crease up into a tin can at the slighest bump from another car, I'd like to see what has happened in real world situations. 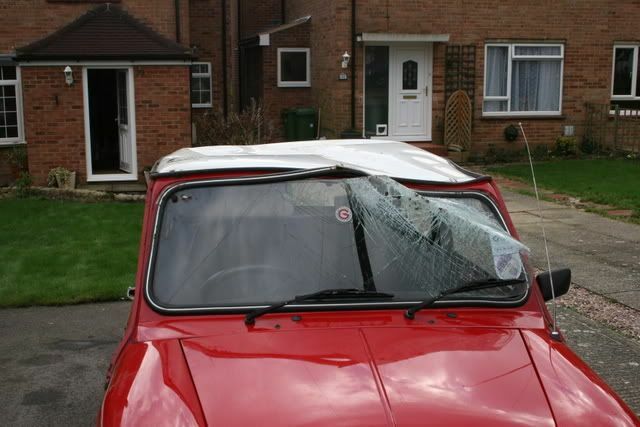 So, post up if you have had and accident in a mini, or found one somewhere on the internet. 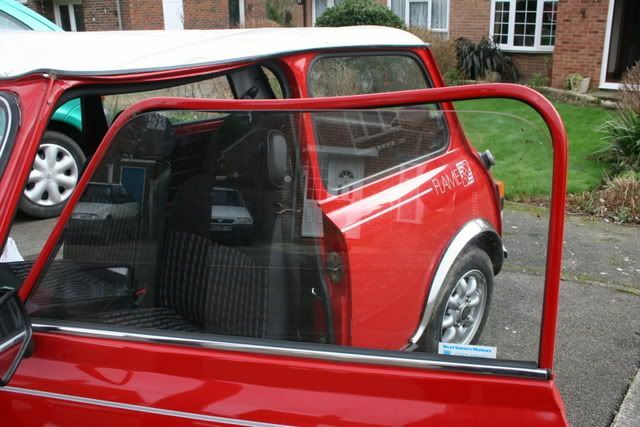 We need pictures so we can see the extend of the damage to the mini, pictures of how much the passenger compartment was damaged would be usefull too. A brief description of how the accident occurred, any injuries, guesstimate of impact speed and any other information you feel is relevant! 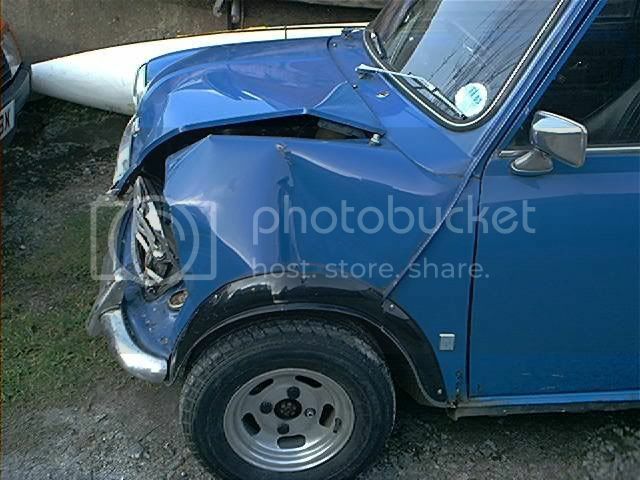 This is the true aftermath of a 55-60mph head on collision between a 1990 Rover Mini Cooper (Mainstream like mine and the Anoraks) and a much larger car. Yep, it was me who crashed that Cooper. Got to add - NOT my fault. The other car was overtaking a tractor & trailer & 2 cars on a blind bend. The car stood up pretty well. The engine moved, but didn't enter passenger compartment. Steering wheel & column moved, (hit my chest). Pedal box remained in place. Feet or legs weren't trapped. The drivers door opened with ease. Could have walked away if I was conscious. Woke up in hospital 2hrs later. Injury wise, ended up in intensive care for a few days & 6 months of work. No broken bones, just a fractured skull, bruised heart, aching ribs, damaged teeth & a few cuts & a massive head-ache!!! Needless to say, it was a right-off!! 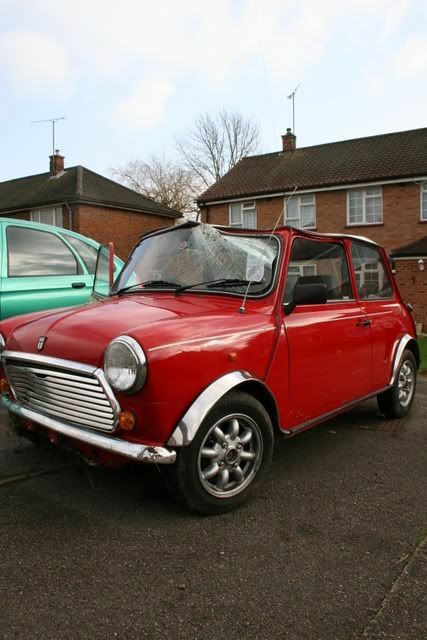 Yes, I bought another Mini, but with airbag this time!! I haven't met Ade yet, but he is from my neck of the woods and he also said that the fire brigade cut him out because they feared he had spinal injuries because his ears were bleeding. But he didn't and it just proves that Minis are tough little cars after all, but I knew that because I've had the odd altercation myself in the 20 odd years of Mini motoring and yet I'm still here to tell the tale. 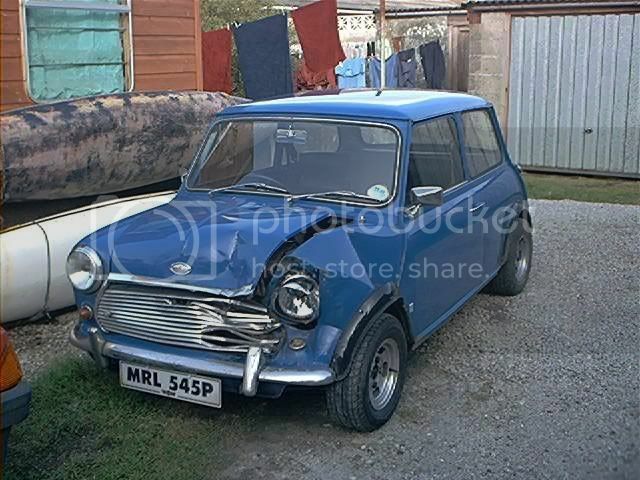 So Jesse go and buy a classic/real/proper Mini, because you don't know what you're missing and for the first time in almost 3 years I drove mine on the weekend and after being used to driving our MPV like someone's granddad, I instantly found myself throwing it around the bends and overtaking larger cars whilst driving up, down and across the mountains where I live and I was king of the road that day. Some big MPV or whatever it was (looked like a BMW?) tried closing in, but I just left him on the twisty bits. Plus I couldn't believe the amount of attention it got and suddenly everyone was, smiling, waving or giving me the thumbs up. Even a load of bikers parked at a lay-by turned to look as I thundered by. Local Club: I want to join Kentish soon! Not as bad as i thought it was when we got it out! And considereing the rear end went in first and the front swung round into the bank, i was fine, no injuries at all!! Pleased with the safety of the little thing! This is certainly going to make interesting reading but is likely to give a biased view as it's only those of us lucky enough to walk away from crashes who'll be able to tell the story. There are all sorts of complex factors that will effect a car's safety record as well as its basic structure - amount and type of usage for example. The band insurance companies put the car in is surely the best all round real world indicator - one by which the Mini scores pretty well. 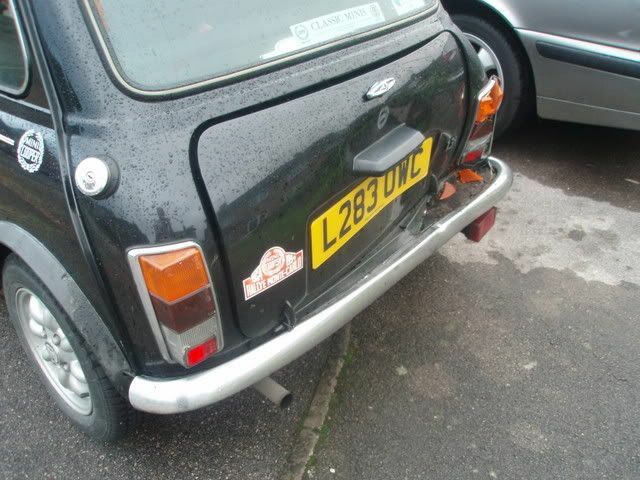 My old Mini hit in the boot while stationary at a red traffic light. Bent the boot floor. Bent the petrol tank filler neck oval. Side panel bent so it rubbed on the door. Subframe moved enough to make the battery cable touch the exhaust. The drivers seat collapsed on impact leaving me laying on my back looking at the roof. The car that hit me hadn't braked and must've been doing near on 30 when it hit the back corner of my Mini. My Mini was shunted across the junction and the other car landed up in a barrier on the other side of the road. 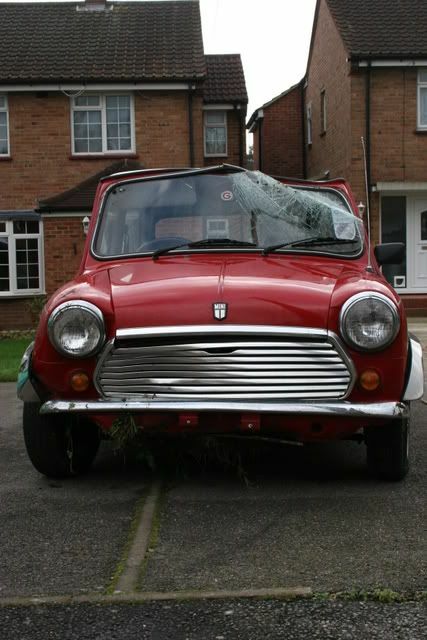 My mate that used to work at Rover said the Mini was good in crashes. He said, and I quote, "They are surprisingly good. They have a thin skin and are full of air - just like bubble wrap." Incidently he now works for Dodge in America. . . This is a professionaly modified subframe for a mini that used to house a B16A2 Honda Engine. I soon needed more power and purchased a K20A Engine out of a 2003 Civic Type R. when it came to fitting i found out that i needed to Modify the subframe further to house the new lump. Unfortunatly 1 day i had a little accident in my car as i was passing a motorbike flat out in 6th gear i clipped the grass verge. You can see the result in the pictures shown. The Subframe is damaged beyond repair but could be coppied easily using another K series subframe. It would take you weeks of messing around to make one of these from scratch. Will update with photos when PhotoBucket is up again. Clipped the grass verge?!?! I thought that would mean just bent subframe.. not a full on damaged wreck!!! bet the crash was scary!! I wonder what the speed was, sounds like he wasn't going very slowly! Interesting to see that the driver/passenger compartment are....'survivable'. 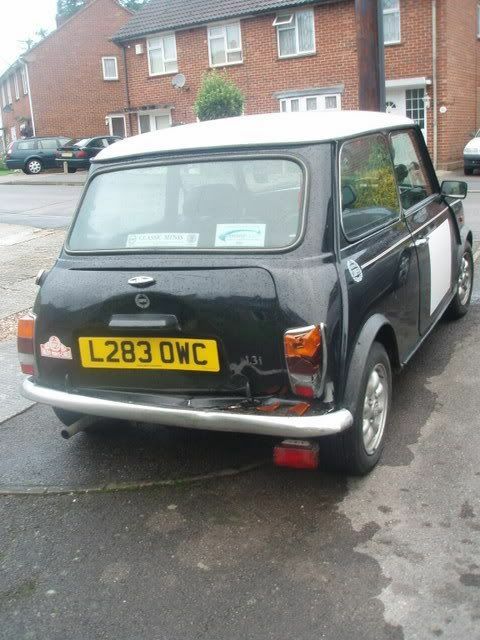 in my irresponsible days, ive written off two mini's. the first one was a red cooper which i rolled with 3 other people in the car. admittedly i was driving like a and i clipped a rear wheel on a hedge which unstabled the car and did a clean flip onto her roof. the roof was almost completely flat to the tops of the seats. luckily we were all quite small chaps and managed to escape though the driver side window. we were going about 50-60 mph. the second one was a black cooper which again, i was driving too fast around the country lanes and i pushed her a bit too hard through a corner, causing the back end to lose grip. the rear just clipped a granite wall making me spin down the lane whilst crunching the front and the back ends in. luckily the middle of the car was fine and dandy so i got out, walked home to pick up the tractor before the police found out. i do have the photo's but they're on polaroid and i dont have a scanner. please please please dont reply telling me of my wrongs- trust me i know! Edited by mini_mission, 01 August 2007 - 01:35 PM. Edited by *Raz*, 24 September 2007 - 10:39 AM. Didn't it get embarrassing Raz?